After four years, Money Manager Review is revisiting Darrell & King with a new interview. We are examining how the firm’s investments have consistently performed well, since then, in a challenging market. You have described the recent past as a “lost decade”. What did you mean by that? We define the period from year end 1999 to year end 2010 as the lost decade because the S&P returned 4.8% cumulative over that period or less than half a percent per year. Meanwhile during that same stretch of zero return for the broad market Darrell & King returned 208% cumulative or 10.8% per year. Please see the graph. Passive management, in the form of ETFs, has garnered a great deal of attention in the financial press lately. This idea makes sense if markets continue to go straight up as the S&P 500 has over the last five years. However, judging by the “lost decade” markets will not go up forever. We believe that sound decision making in the form of active management can produce outsized returns compared to the market throughout a normal market and economic cycle. 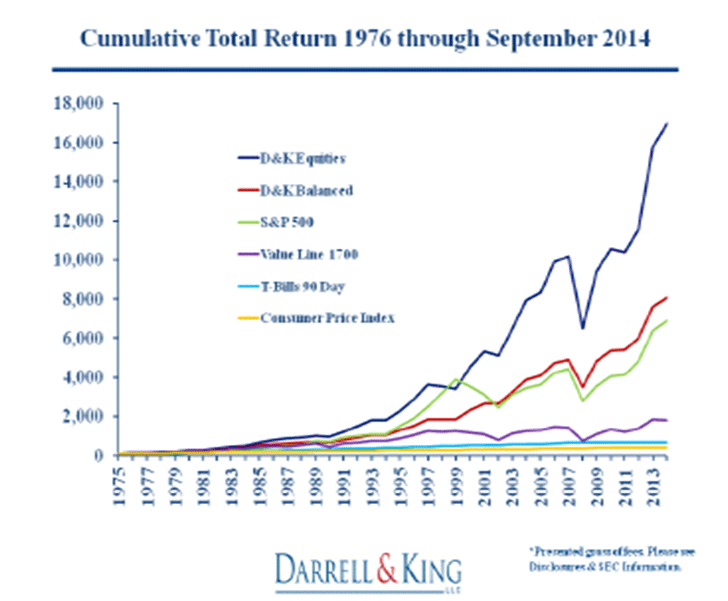 What is Darrell & King’s general investment philosophy and why do you think it works? We want to select strong companies that can grow faster than the economy. D&K manages a concentrated portfolio, by industry standards, and we try not to put ourselves at risk of making behavioral mistakes. Our 20 name portfolio avoids any sort of “style box” classification and we invest where we see opportunity. For example in 2007 we sold all of our financial stocks and we did not hold any tech stocks during the technology crash. This opportunistic approach works because we apply strict discipline and critical thinking. Unlike Japan, the US seems to have fared well despite the economic crisis of 2008. What gave you confidence that the markets would recover despite an almost complete collapse of our banking system? If the financial sector found its footing we had confidence that production and consumption would continue. On an individual company basis, the businesses we invested in at the time adjusted cost structures quickly. Balance sheets remained healthy. We increased consumer discretionary exposure in February of 2009. Those companies had strong brand recognition and showed break-even to positive cash flows. So if the market believed consumption would return, the investments would take off. Our portfolio increased 45% in 2009 versus only 26.5% for the S&P 500. After the 2008 market collapse, some policy makers preached austerity and others favored strong economic stimulus. Did either of these conflicting scenarios affect your investment decisions? We did not make investment decisions following the 2008 market collapse based on the likelihood of either one of these policy decisions. One thing we try to do is look past short-term volatility. A lot of market participants define risk as volatility. We take the view that volatility provides opportunity. Our investments are made with a three to five year time horizon and a 50-100% return expectation. With those characteristics built in we felt we could look beyond the short-term volatility created by stimulus or austerity. We did believe stimulus would benefit the stock market in the near-term and that austerity would potentially reset the base for stronger growth in the future. So we saw investment positives from both pathways. With the collapse of the US housing market, were there any economic sectors that you intentionally avoided? Leading into the bust we sold all of our financial stocks (three banks) in March of 2007. We saw the greatest exposure to a potential bust within that sector. As I mentioned before, we avoid style boxes and prescribed market exposures. So we have no problem not investing in a given industry or investing heavily in a given industry. We did not come back to financial stocks until early 2013. How did you identify companies that were going to recover faster than the general economy? In our investment meetings we do a lot of thinking and discussing of the overall market and economy, as well as specific investments. We try to answer the question of which sectors appear attractive at a given point in time. Similarly, we look for strong companies within those sectors. We perform all of this research in house. A thorough financial analysis and knowledge of a company’s end markets provides the basis for determining an investment’s growth prospects compared to the economy. All of our investments are investment grade, so they do not go too far along the risk curve on an individual basis. Earlier I suggested that we heavily weighted consumer discretionary coming out of 2008. Not only did our investments within that sector look strong financially, but the market had given up on the stocks and the prospects of the businesses. We felt that if the consumer returned even a little bit the businesses and the stocks would outperform. As an investment manager, what are the most important factors you use in defining relative investment value? We try not to get too caught up in relative investment value comparisons on the macro scale. For example, at times during the last five years the financial media has called high yield fixed income a better relative value to other bonds. That may or may not be the case. However, we think all of fixed income provides very little absolute value. There are too many ways to lose either from the standpoint of principal or purchasing power. (Our thoughts on this area can be seen on our website from the first quarter of 2013) So when we look at investing our clients assets, if we do not see absolute value, we stay away. Our current fixed income exposure can only be found in client accounts who have mandated a certain minimum allocation. On an individual investment level, if we are making a decision between three potential investments in the same industry and we want to determine which of the three has the best prospects, we will look at free cash flow, return on capital, capital structure, track record, management and several other determinants of valuation. Why do you think market values have doubled over the past 7 years while the GDP has only returned to pre-recession levels? First, we came off a low base. The market tends to overreact to the upside and downside, so the doubling does not surprise us. Second, cost structures have been made much more efficient across the board at the corporate level, so valuations have reflected that. Third, the economic stimulus has helped push stock prices up. It has remained a bad idea to fight the Fed during the recovery. Having said that, we do not see the market as overvalued or undervalued at this point in time. Some companies fit each of those bills, but we still see companies with reasonable stock valuations and strong operational prospects. Were there any economic indicators that give you the confidence to remain fully invested in the stock market? The indicators we feel positive about include, improving unemployment, excess plant capacity, improving (albeit as you pointed out slightly) GDP, money flows between stocks and bonds, low interest rates, lower energy prices, and improving household net worth. With the recent rapid decline in the oil and gas market the market and the financial press seem a bit jittery. However, we see a lot of positives still out there. Were you long-term investors or did you find that you had to trade frequently because of changing economic conditions? Without a doubt we invest for the long-term. Our turnover averages only about 20%. Economic conditions do not bounce around to the degree that we feel justifies frequent trading. Our most recent investment took four months of discussion and ongoing analysis before we implemented the trade. The positive conditions for that investment existed the entire time and we do not think we lost any upside by methodically examining the company and its market. How much weight did you put on a company's fundamentals versus your outlook for the overall economy? This question has two answers. The outlook for the overall economy and specific sectors plays an important role in our analysis. There will be times like right now in oil and gas when no investment (or very few) within a given sector of the economy works because the sector has one or several negative characteristics dragging it down. However, at the end of the day a company’s fundamentals must be in place in order for it to succeed within a given economy. So we feel investors must remained attuned to both factors. Recently we’ve seen a big devaluation of the oil market and some foreign currencies. What effect do you think this has on long-term stock market performance? Assuming that energy prices remain low, are there any sectors that you think might either benefit or be avoided? Most sectors benefit from lower energy prices – chemical companies, manufacturing and consumer discretionary to name a couple. We sold our energy exposure in August, so we think that sector should be avoided currently. When we make decisions like that, it does not mean stay away forever though. Just like when we never bought into the tech mania, or when we sold banks in 2007, or selling bonds (shortening maturities) in early 2013, there will be a time when we will own the sector again. Energy drives the global economy. In order to give our clients the best chance for outsized returns, we have to constantly evaluate all sectors – but especially the out of favor ones. Tell us more about how you go about finding investment opportunities. Where do your investment ideas come from? We utilize a top down and bottom up approach to finding investment opportunities. Sometimes the economy and/or a market opportunity will more greatly inform a specific investment idea. Sometimes we will find a great company that can perform as an investment regardless of the macroeconomic picture or the fundamentals of its sector. This process is another reason we do not encourage people to “put us in a box.” Our opportunistic approach to finding investment returns dictates that we constantly have our eyes and ears open. For example, that recent investment I mentioned that stemmed from a four month analysis came from the investment committee chatting informally about the future of retailing and the mall. We then took a deep dive into that world and came to several different conclusions. Ultimately we chose an investment that reflected our thoughts on the area, looked reasonably valued, and could grow faster than the economy. So we do not have one magic screen or one source of investment ideas. They come from looking at the economy, the market and individual companies and thinking about what gives the portfolio the best chance for success. How do you go about diversifying your portfolios and how do you handle market volatility? 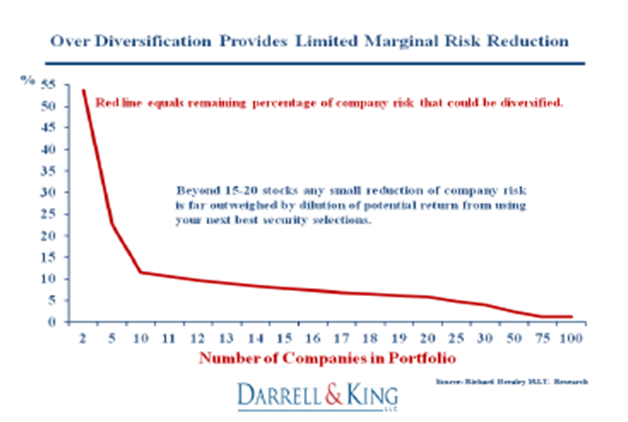 We subscribe to the academic study by Richard Brealey that the marginal benefit of diversification after about 15 stocks becomes more and more minimal. Please see the graph. Our portfolio always includes about 20 names. As long as we remain diversified across sectors, we feel that the portfolio maintains proper diversification. We believe the more names in the portfolio the more it will resemble the index. We do not believe that an investment manager can beat the index year in and year out. However, through a cycle we do want to beat the index and have 39 years of history to support this belief. Please see the graph on the next page. Our portfolio construction benefits that goal. So does market volatility. We embrace volatility because it supplies opportunity. An advantage that we have over an index fund is the ability to change our thinking during periods of volatility – either fear or greed based volatility. Periods of volatility during the lost decade allowed our decision making to distinguish itself versus the index. We see this in the aforementioned performance differentiation. Are there any market conditions that would cause you to liquidate some or all of your portfolios? We pride ourselves in part on our flexibility and critical thinking about the markets and economy. Yes, there could be conditions when we raise cash. For example, we have held more cash when we have expected a correction or when we have believed certain sectors of the economy seem stretched. As we speak, we do not see those conditions. That does not mean the conditions will not appear tomorrow. Usually, conditions do not simply appear overnight though. Things tend to build. One could reasonably argue that the production numbers in the oil and gas industry have for several quarters suggested an oversupply on the horizon. Despite it seeming like an overnight collapse of the oil price, we think conditions in that industry have been building and at a point this fall we reached a tipping point. We constantly observe and monitor the market for these sorts of signals. As I said, we do not have one magic screen. We use our firm’s biggest asset – experience – and try to think critically about the world around us. Next year both houses of congress will be controlled by one party. Would this affect, in any way, how you make investment decisions going forward? We can look at how the market has performed historically based on the parties in Congress, the Presidential term, etc. (On this topic, please see our quarterly newsletter from third quarter 2012 ) However, that will not affect our company specific stock picks. We may determine that some industries could receive a benefit from a Congressional sweep but at this time it does not drive our decision making. Tell us about your fixed-income investment strategy and how you use them with your equity composites? We present two composites to Money Manager Review. One is our All Equity composite. The other is our Balanced Composite. The Balanced Composite includes fixed income securities and represents several large non-taxable clients who have mandated we hold some fixed income on their behalf. So the All Equity Composite contains no fixed income. As I mentioned earlier, we do not favor fixed income at this point in time. We almost definitely will in the future but again it comes back to absolute value and return at the present time – we do not see that in the fixed income market today. Our Balanced Composite has generally underperformed the All Equity Composite, which we would expect over time given the fixed income component. You report more than one equity composite to Money Manager Review. As investment strategies, how do they compare? The All Equity Composite and the Balanced Composite’s key difference is the presence of fixed income within the Balanced Composite. The equity portion of the Balanced Composite is the exact same as the All Equity Composite in terms of names – just with a lower percentage allocation due to the increased allocation to fixed income. At this point in time we recommend the All Equity approach to all of our clients. For those who want a fixed income component either via mandate or preference, we happily oblige. Our current focus in the fixed income market includes short-term government bonds. We would expect over time that the Balanced Composite trails the All Equity Composite in terms of performance. However, we have experienced times when the fixed income component has clearly benefited performance of the Balanced Composite. Can you give us a brief biography of the principals in your firm? John S. Darrell, CFA (Jack) founded the firm in 1975. Prior to that he graduated from the University of Virginia and worked as a registered representative for firms in New York called Shields, Model, Roland, as well as Thomson, McKinnon, Auchincloss. Jack is a Chartered Financial Analyst (CFA). Jack has built the business over time in a very deliberate manner. We do minimal advertising and almost all of our clients have been referred. That leads to some very close client relationships built on years of trust. Charles G. King, CFA (Charlie) joined Jack in 1986. Charlie graduated from Wake Forest undergrad and received an MBA from the University of North Carolina. He is also a Charted Financial Analyst. Charlie was the youngest Director of Research at Wachovia in Winston-Salem. He and Jack met when Charlie came to Charlottesville to work as a portfolio manager and analyst at Chase Investment Counsel Corp. Charlie heads investment research for Darrell & King. Elizabeth P. Morris (Beth) joined Jack and Charlie in 1993. Beth graduated with distinction from the University of Virginia. Here Beth holds the team together in a multi-functional role including client relations, coordinating and executing trades, and managing operations. In addition to the trust that builds, the key reason we find that people become clients of Darrell & King comes from the aforementioned experience. When things become turbulent in the markets a sense of calm resides over the office. Jack and Charlie have lived and managed through every type of stock market and economy. That experience leads to rational and steady decision making. Clients appreciate that this experience has prevented themselves from making decisions negatively affecting their wealth during times of stress. How many portfolio managers are on your investment team and how do you work together? In addition to the principals just discussed, the rest of the team includes me, John M. Wells, CFA. The four of us comprise the investment team. Charlie heads the research effort. We work well together hashing out investment themes and ideas. Often one of us will chase down one aspect of an idea while another looks for some other piece of the investment mosaic. At the end of the day decisions never get made in a hasty manner. We always try to air all the issues with a particular investment. Then we make a decision and implement it. Additionally, all of us know all of the clients’ accounts, so we can assist with any questions a client may have. Team members immediately fill in when one person needs help. Due to our size, we run efficiently and are all well versed in each aspect of the investment decision making process as well as the business. How do D&K’s investment strategies compare with the many other choices available to investors? Our investment strategy revolves around supplying each client the portfolio with the best chance of protecting his or her money as well as making it grow. So much like a partnership set up (e.g. hedge fund) each client holds the same stocks (with some exceptions like a client came in owning a big piece of a certain stock). However, each client’s account is separate and the clients have access to their accounts and positions. The majority of our accounts have Charles Schwab as the custodian. Compared to industry standards I would say that D&K maintains a fairly concentrated portfolio. That concentration gives us the best opportunity to outperform over time. When market conditions change we feel that we can affect significant change on the portfolio with a handful of trades. If we have five consumer discretionary stocks in the portfolio that represents 25% of the portfolio and a significantly different weighting than the index. So very quickly and with few trades we have changed the complexion of the portfolio to represent a view on a given sector. Managing a portfolio of 100 or 200 investments, a manager will have more trades to affect the same change and it is unlikely he or she knows the names as well as in our more concentrated portfolio. As I mentioned we have a three to five year time horizon and 50-100% return expectation combined with little turnover, which in addition to giving each investment decision an implied margin of safety, it is more tax efficient for the client. We also eschew the style boxes and maintaining exposure to each sector within the index at all times. Why would we invest in a sector that we do not think is going to make money today? We believe that all of these characteristics differ from the industry and provide our clients the opportunity for long term outperformance. We also do some things that specifically limit the behavioral errors that portfolio managers make. For example, we believe moving a position around 25 basis points at a time provides very little impact to the portfolio and client, but may also undermine performance over time. 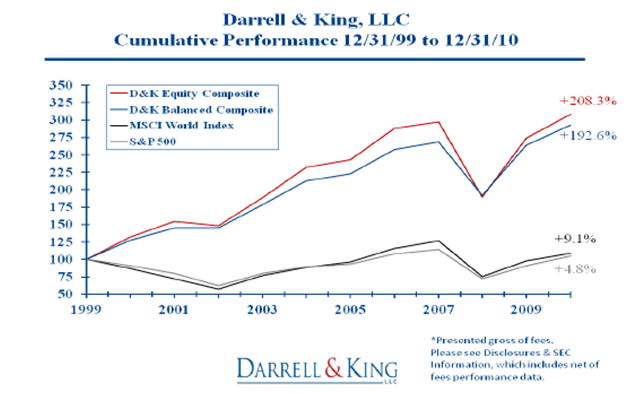 How can investors learn more about Darrell and King and the investment programs you offer? To find out more about Darrell & King please visit our website www.darrellandking.com. 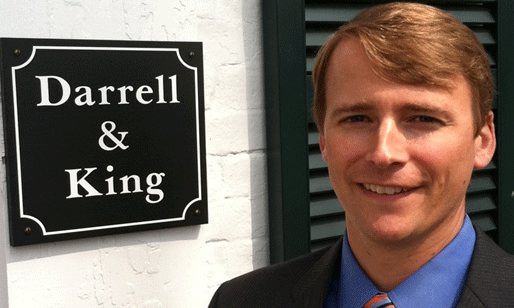 You can also call the office at 434-977-7010 or email me at jwells@darrellandking.com. Our minimum investment is $1 million and the fee structure is simple – 1% of assets under management to $5 million and 0.5% above $5 million. Our clients include individuals and families, corporate retirement plans and foundations. Thank you for the time Peter.